Welcome to the world of frog identification. In the United States, the world of frogs can mean anything from the over one hundred documented frog, tree frog and toad species. This article only refers to the true frogs. For additional tree frog and toad information, please press the frogs button. 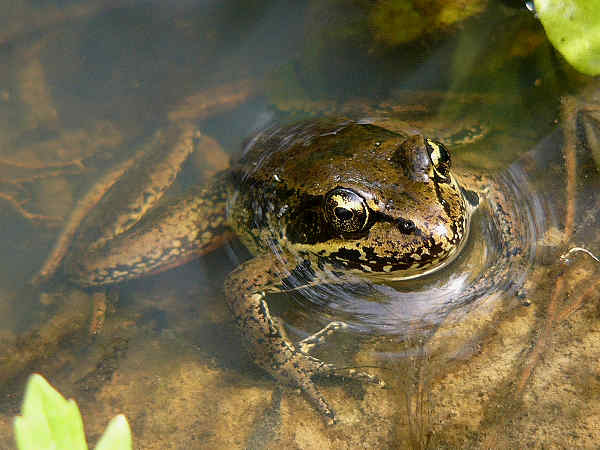 An introduction to frogs in the United states starts with quick answers to five of the most common frog questions. Do frogs have ears? A. Yes, notice how they jump away when they hear you walking near them. Do frogs have gills? Yes, they help them breath during the tadpole stage of life. Do frogs have teeth? Yes, on the upper jaw. Only one species in the world, so far discovered, has teeth on both the upper and lower jaw. How long do frogs live? Some frogs never even reach the tadpole stage. Some frogs in captivity can live over twenty years. Frog age depends on the frog and the environment. Frog identification can be straight forward after you get some basic information down and get past some recent taxonomy changes. Many people grew up in a pre-2006 world where the true frogs of the United States were all categorized in the Rana genus. Post 2006 saw a taxonomy change that divided the group into at last two smaller groups. True frogs, the Rana, were limited to a group of water frogs that shared similar DNA characteristics in the northern hemisphere. 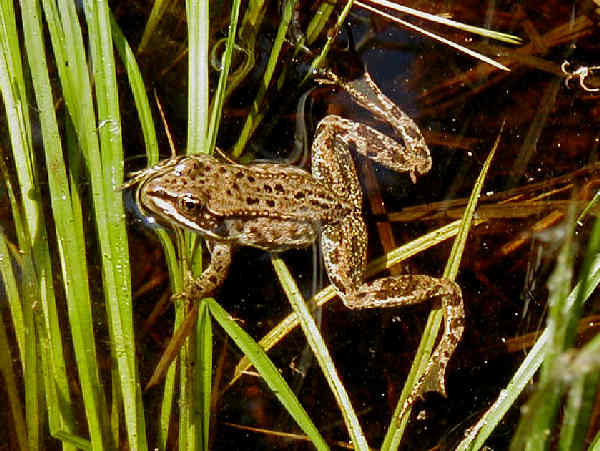 Many of the American frogs were then moved to the Lithobates genus. Older texts will often still have the Rana description in the formal Latin name for the frogs. 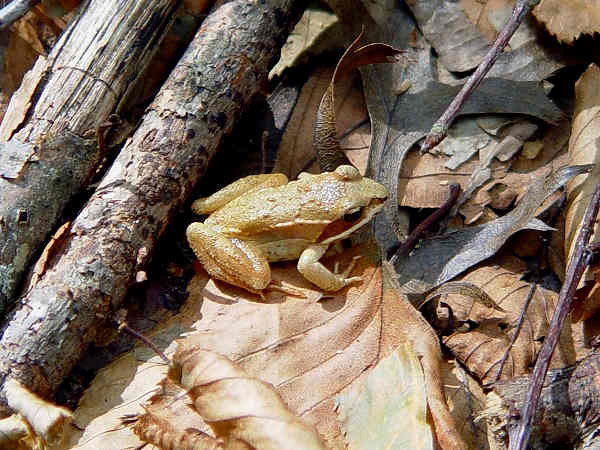 This review of the frogs in the United States focuses more on frog identification using pictures and some general field identification clues. It starts with the Lithobates, more commonly called American water frogs. Nine of the twenty two species are Leopard Frogs. The first two pictures of the Chiricahua Leopard Frog from Arizona and the Northern Leopard of, well the north areas of the United States, visually explain the ease of identification. They are frogs with green spotted bodies. Most of the species are medium size, between two to four inches. They can often be found near canals and ponds. In states that have overlapping species identification can be a challenge. 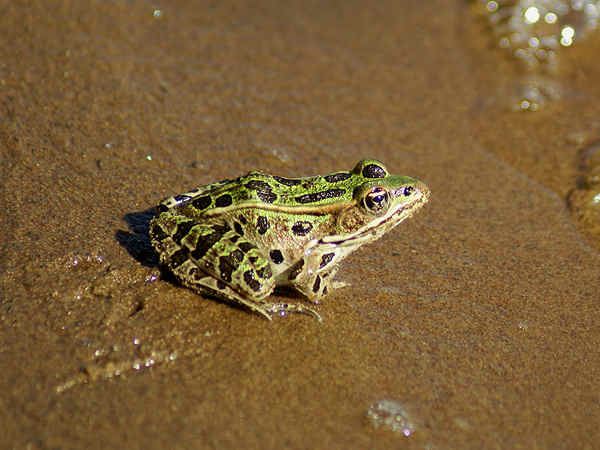 New Jersey, for example, recently discovered they had three different species, the Northern, Southern and Atlantic Coast Leopard Frog. 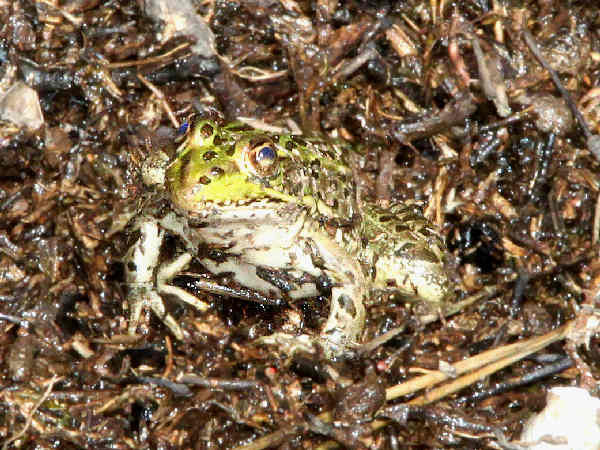 The Atlantic Coast Leopard Frog was officially “discovered” as a new species in 2014 based primarily on the call of the male. Green or Bronze Frogs are usually dark green or bronze in color depending on the environment. They are medium sized frogs found in most areas of the Eastern United States. The presence of skin folds behind the eyes and down the body are the best field identification clues. Carpenter Frogs are small frogs found along the coastal areas of the Southeast. The presence of light lines going down the back are the best field identification clues. Crawfish frogs are medium sized frogs that inhabit areas along the Mississippi River Valley and the Gulf Coast, where ever one of their food sources, crawfish, live. As the picture highlights, they have a light colored body that is heavily spotted. Add in some skin folds and that translates into easy identification. 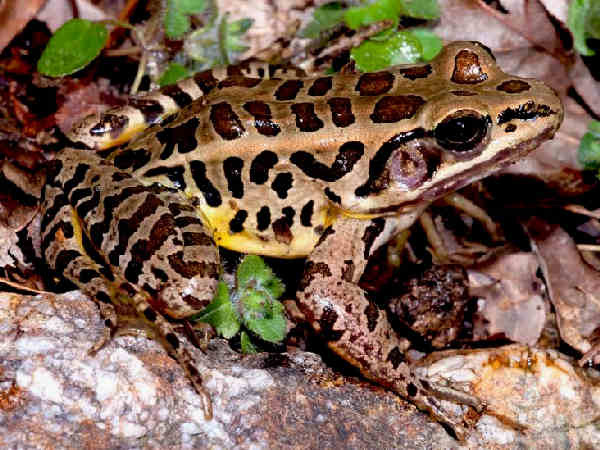 Pickerel Frogs might initially be mistaken for Leopard Frogs. The presences of two rows of spots between the dorsal folds is the best field identification clue. Except for portions of the extreme Southeast and Florida, they are common in the Eastern part of the United States. Wood Frogs are small and hardy frogs that live in the Northern Boreal Forests. You could call them the raccoons of the frog forest because the black mask on the eyes is the best frog identification clue. River Frogs can grow up to five inches, making them one of the largest frogs in the Southeast. They live next to rivers and streams. Location, size aand the spots or blotches on the sides are the best identification guides. The true frogs or Rana species in the United States are mostly limited to Western species. The color of the legs is also a prime field identification clue. For example, three of the eight Rana specis are yellow-legged frogs. 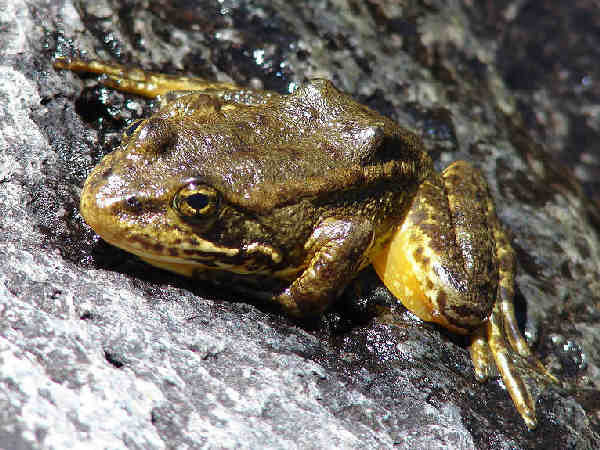 As the picture of the Mountain Yellow-legged frog highlights, the yellow coloraton on the underside of the leg is the principle field identification clue. 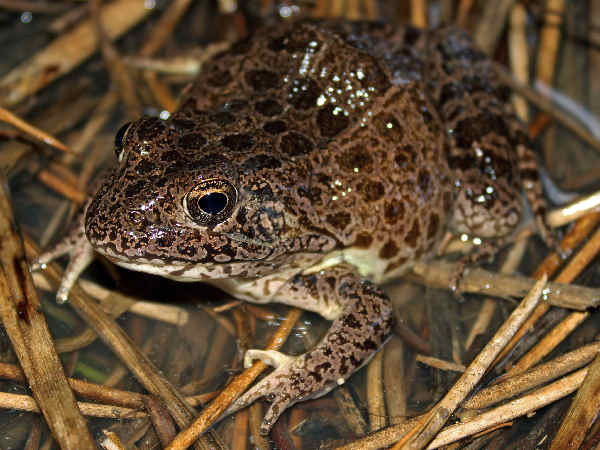 All three species are California frogs, although the Foothills species overlaps into southern Oregon. 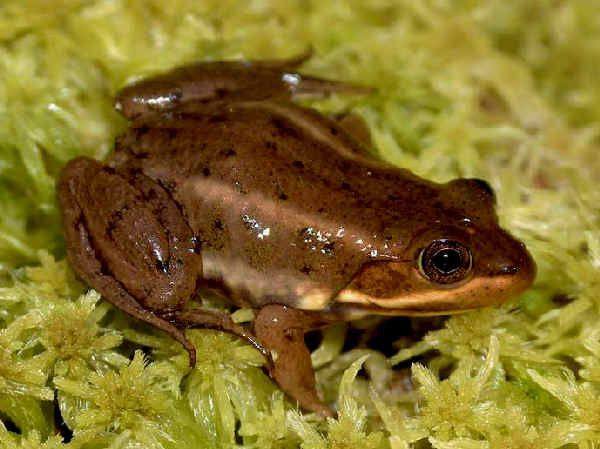 Two of the Rana Species are Red-legged frogs. And again, both are West Coast Species. 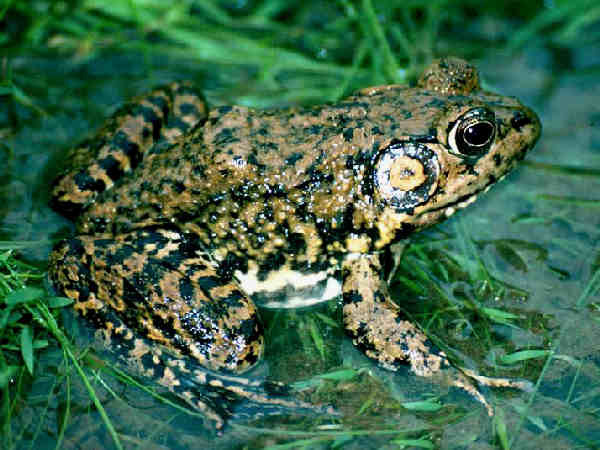 The Northern Red-legged frog lives in the coastal plain from Northern California to British Columbia. The California Red-legged frog picks up its range where the other leaves off. From below Northern California down the coastal areas of the state. The picture highlights the rod coloration on the underside of the legs. 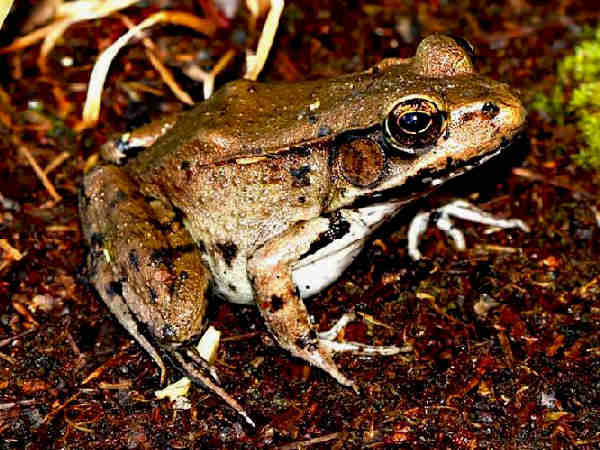 Columbia Spotted Frogs and Oregon Spotted Frogs and Pacific Northwest species. The presence of spots all over the body suggest a Leopard Frog. However they are a distinct Rana species with a stripe on the lip.